The end of National Poetry Month. Can't say it was much different from March – at least not here in little Saint Marys. I close with this photo, taken yesterday, of 92 Wellington Street North. 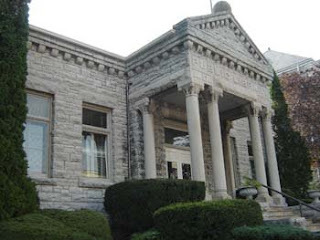 This Victorian Italianate, eight short blocks from the home of James MacRae, is the birthplace and childhood home of David Donnell, whose Settlements received the 1983 Governor General's Award for Poetry. Seventy-five years ago today Jean-Marie-Rodrigue Villeneuve, Archbishop of Quebec, had Les Demi-civilisés placed on the Index of Prohibited Books, thus ensuring that there will always be those who make a special effort to track it down. Not always an easy thing to do. 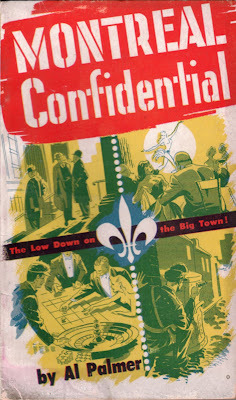 While Cardinal Villeneuve's condemnation most assuredly helped spur sales – the 3000 copy print run sold out in a matter of weeks – it also meant that the novel, Harvey's second, remained out of print until 1962, when a revised edition was published. In his 'CONDEMNATION DU ROMAN "LES-DEMI-CIVILISES"', the Cardinal cites article 1399, 3°, of the Code of Canon Law, which calls for the banning of works that 'purposely attack religion or good morals'. In fact, both are left unscathed; the reader finishes the novel with virtue intact. Harvey doesn't attack religion, but the Church. His demi-civilisés are not the uneducated, but their repressors: an alliance of clergy, politicians and businessmen. 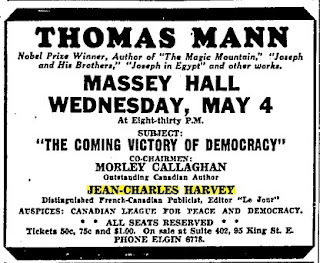 A pariah to some, a hero to others, Harvey did maintain a certain profile, and was sought out as a speaker. Pierre Chalout of Le Droit called him the 'grand-père de la révolution tranquille', yet during the final years of his life Harvey fell out of favour with a thud. His promotion of bilingualism and defence of federalism, as articulated in Pourquoi je suis anti-séparatiste (1962), alienated a great many Quebec intellectuals. Thirty-two years after his death, Quebec City has no rue Harvey, nor does Montreal. All but one of his books is out of print. Les Demi-civilisés is one of a very small number of Canadian novels to have received two English language translations. The first, by Lukin Barette, is saddled with the rather unfortunate title Sackcloth for Banner (Toronto: Macmillan, 1938). As if that weren't bad enough, it may well be the worst translation yet made of a Canadian novel. 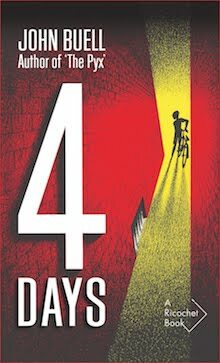 Barette omits passages, changes names, invents dialogue and commits what amounts to a rewrite of the final two chapters. 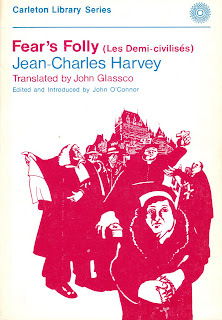 All is set right with Fear's Folly, John Glassco's 1980 translation, published two years later by Carleton University Press. Object and Access: Sadly, predictably, all but absent from our public libraries. A decent copy of the first edition is currently listed online at US$30.00. An incredible bargain. English-language editions aren't dear. As Sackcloth for Banner, it goes for between C$60 and C$135. Fear's Folly is usually on offer for about C$15. But only big, and rich, and dull. A sequel, of sorts, to yesterday's post. On my recent trip to Montreal I took several photos of things Glassco. The poet had a complicated relationship with the city of his birth. At eighteen, he saw it as a place of provincialism. 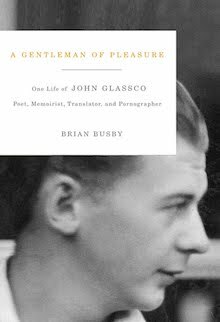 Glassco famously fled for Paris, where he enjoyed and endured Montparnassian adventures and was very nearly felled by tuberculosis. Yet, this same Montreal – the Royal Victoria Hospital, to be precise – held the knowledge and ability that saved his life. After his recovery, Glassco again escaped the city, settled in the Eastern Townships, and lived for decades as a semi-recluse. It was only in his last two decades that he truly returned. Many of his final years were spent on an unpublished novel, Guilt and Mourning, set in a fantastic Montreal that has been spared the destruction of the 20th century. 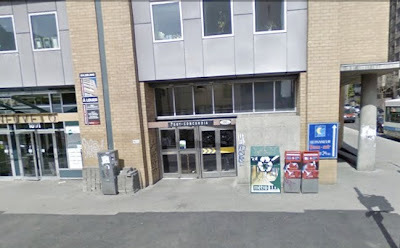 Above is the westernmost entrance to the Guy-Concordia Metro, located at the northwest corner of St-Mathieu and de Maisonneuve. In 1909, it was the site of a grand house in which the poet was born. This stretch of de Maisonneuve was then known as St-Luc – hence, 'Jean de Saint-Luc', the pseudonym he claimed to have used for Contes en crinoline, his non-existent first book. St-Luc was made part of de Maisonneuve in the 1950s (following modifications to the intersection at Guy). Simpson Street's Chelsea Place, looking towards Sherbrooke. A large gathering of Neo-Georgian homes with pleasant courtyard, it rests on the foundation and grounds of Edward Rawlings' mansion. 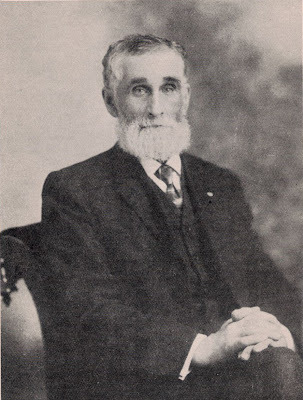 Rawlings, the founder of the Guarantee Company of North America, was Glassco's grandfather. The poet often claimed the mansion as his birthplace – not true, though he did live there for several years as a boy. In 1925, it was sold and razed; the gardens were plowed over and its peach orchard was destroyed. All that remains is a lone chestnut tree (to the left of the passing PT Cruiser). 3663 Jeanne-Mance (right door, two uppermost floors), Glassco's final Montreal address. He shared this flat with his second wife, Marion McCormick, for nearly ten years. On 29 January 1981, the poet died in a small room on the top storey. The launch of Project Bookmark Canada today, an initiative that brings to mind a recurring question: Where are our blue plaques? Even the most dozy and inattentive visitor to Greater London is familiar with these simple, yet elegant fixtures. They number over eight hundred, marking historic sites and former residences of great figures like Jimi Hendrix and George Frideric Handel — next-door neighbours separated by 208 years. 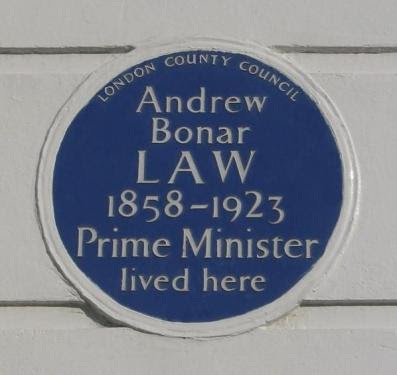 A personal favourite is located at 24 Onslow Gardens, once home to Andrew Bonar Law of Rexton, New Brunswick, the only British Prime Minister to have been born outside the British Isles. The success of the 142-year-old scheme is such that there are tourist guides devoted not to Greater London, but to its plaques. Next week will see a new coffee table book, Lived in London: Blue Plaques and the Stories Behind Them, published by Yale University Press. Despite all good intentions, and a great deal of effort, we have nothing that compares in this country. I imagine developers don't much like the idea. They've had a hard enough time ripping down venues like Montreal's Seville Theatre without a fixed reminder that Duke Ellington, Louis Armstrong, Count Basie, Frank Sinatra, Nat King Cole and Peggy Lee performed on its stage. And so, I choose to blame developers and indifferent city councillors for this embarrassing admission. Early in my work on John Glassco, I enjoyed a pint at a Bishop Street pub, entirely unaware that the very space in which I was sitting had once served as his pied-à-terre. Update: Expat writer Mark Reynolds, who posted the interesting comment below, shares further thoughts on the matters of historical markers and the naming of our streets and schools on his blog View of the marching fishes. 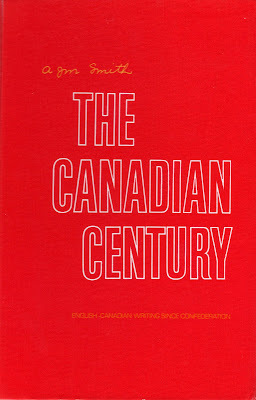 The Canadian Century is the tardy companion to The Colonial Century, a textbook that began life in 1965 as The Book of Canadian Prose: Volume 1. Worth the wait? I think so. Smith wastes more than a few of the 652 pages on things like Hugh Garner's 'One- Two- Three Little Indians', but this is more than offset by the inspired, accomplished and all too often overlooked. The reader is presented with writing by Edward Blake, Wilfrid Laurier, Northrop Frye, Leonard Cohen and Alice Munro. Louis Riel's eloquent, if confused, final statement in The Queen v Louis Riel is included; as is John Glassco's comic memoir 'A Season in Limbo', otherwise only available in an old number of The Tamarack Review. 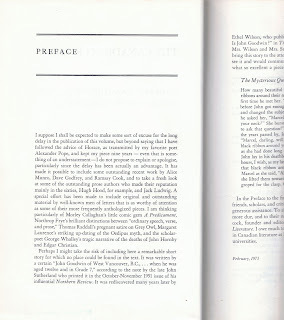 Preceding all is a piece titled 'The Mysterious Question', which Smith chose to include in his Preface. Smith knew the true identity of the author; in 1969, he and Glassco had exchanged correspondence about Sutherland's prank. Yet, the anthologist appears to have had no qualms in furthering the ruse... for a while. The Canadian Century was reprinted at some point. Hard to tell when. The title and copyright pages are identical, the design is unchanged, yet 'The Mysterious Question' has disappeared. Object: Well, it's a textbook: bland layout and paper of a shade that induces symptoms not dissimilar to snowblindness. Simultaneous cloth and paper editions. Access: Not as common as one might expect. A handful of copies are currently listed, the most expensive coming in at US$15. Seems everyone thinks that they're offering the first printing. Maybe they are. The second printing is scarce — in his A. J. M. Smith, An Annotated Bibliography (Montreal: Véhicule, 1981) Michael Darling writes that he'd been unable to locate a copy. Foot fetishists aside, who knew? Montreal moves at a much different pace than quiet St. Christophe. Gisele gets a job waitressing in a cheap restaurant, but flees after her oily Greek employer tries pawing her. In the next 48 hours, she becomes a chorus line dancer, meets the love of her life, makes a BFF and loses her virginity. Events were piling up too fast for her to cope with. She couldn't think clearly. She closed her eyes tightly and shook her head to free some of the turmoil that raged within. 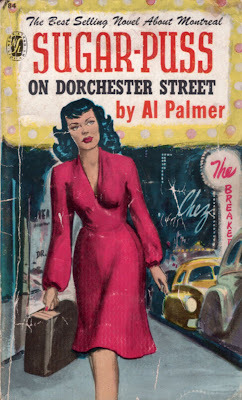 Next is a marriage proposal, the move to a luxurious apartment, a shoot-out with police, a death, another marriage proposal, a kidnapping, a car chase, a second death and a walk 'into the brilliant sunshine of Dorchester Street.' It's a helluva week. 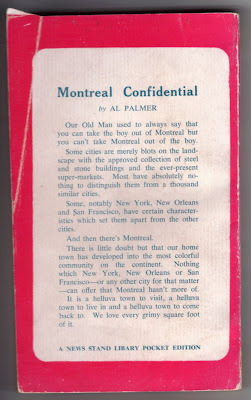 This was Al Palmer's first book, published the year before Montreal Confidential. I'd have preferred the latter had it not been for the intriguing cover copy on Sugar-Puss: 'He takes his readers behind the scene of a metropolitan newspaper. He takes them backstage to the city's leading night clubs and introduces them to the fabulous characters he knows so well.' Just who are these people? We meet Jim Schultz, a former boxer, who assures a nervous Gisele: 'you're just as safe as if you were in yah mudda's arms. Safer unless yah mudda's got cauliflower ears.' The 'bistro bossman' of The Breakers — really Slitkin's and Slotkin's — he may have been inspired by one or both of the owners, former boxers. Or the model may have been Maxie Berger, who, like Schwartz, was welterweight champion. And what about Gaston Courtney, the drug dealing night club owner? Who inspired Diane and Trixie, Gisele's fellow hoofers? The questions linger. 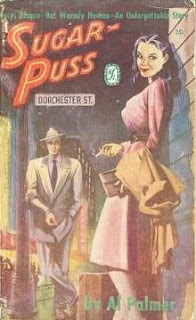 Object: 'Sugar-Puss' or 'Sugar Puss'? Picky, I know, but the inconsistency points to the sloppy editing and production values of the News Stand Library. In my copy the very first sentence of the novel fades into nothingness: 'Dorchester Street spews out almost...' Almost what? The mystery is nearly enough to erase the image of vomiting asphalt. Access: 'The Best Selling Novel About Montreal' claims the first edition, first printing. However could they have known? News Stand Library's second printing appeared four months later — with a new cover in which Jimmy and Gisele look like pimp and prostitute. Library and Archives Canada doesn't have a copy of either edition; the curious are directed to the Toronto Public Library, the University of Toronto's Thomas Fisher Rare Book Library and the University of Calgary. An uncommon title, prices have risen considerably these last few years, and are currently in the C$60 to C$80 area. 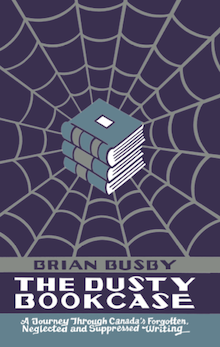 One bookseller is offering a copy of the second printing in a very scarce dustjacket. At $C90, it may very well be a bargain, despite some loose leaves. Readying for a trip to my hometown, I reach for this cheap little paperback. A bit of a lark, really — this is a Montreal that no longer exists, one I know only through ephemera, flotsam and William Weintraub's excellent City Unique. Palmer's book sells glossy snapshots of a time when Stanley was Swing Street and St Catherine was known as St Kit's ('as every native Montrealer calls it'). These were the years of radio personalities, hat check girls and Lili St Cyr, 'who spreads an epidemic of striptacoccus'. It's easy to see why Weintraub dubbed Palmer the 'poet laureate of Montreal nightlife'. In his eyes, dancers aren't dancers, they're glamorines who pitch their curves around while gawkers down stagger syrup. If it is at all possible don't go out on Saturday night. That is the night when all niteries are jampacked by those of the lesser income brackets. Cafe Society usually remains at home and house parties are the gathering spots of those who would normally be ringsiding it. Saturday night is the one night the shoe clerks go out and howl. Seven years after Montreal Confidential appeared in drugstores, the Herald folded; Palmer moved on to the crime beat at the Gazette. He died in 1971. Trivia: Concordia University holds the Al Palmer fonds, which includes well over 300 photographs of the era's nightclub entertainers, and at least one of the author himself. Object: Cheap and nasty. My copy has a poorly cut head and isn't even rectangular. Access: Library and Archives Canada has a copy, as does Concordia, but that's it. 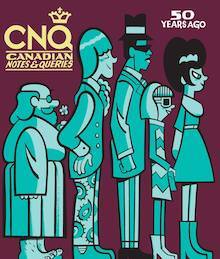 A handful of acceptable copies are available from online booksellers at between C$30 and C$40. MacDonald is buried in the St Marys Cemetery, sharing a plot with his wife and a daughter. A bit of a risk acknowledging National Poetry Month on a day when people are looking-out for hoaxes and practical jokes. I double the hazard by focusing on this book, with its lousy cover and cheap sales pitch. 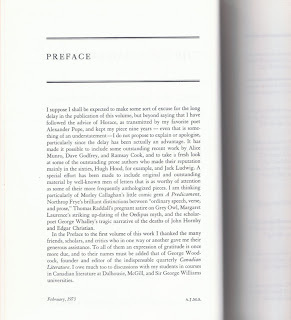 The whole thing looks a bit fake - but, as George Fetherling (then Doug) notes, Deacon's book is 'that rare thing in Canadian literature: an underground classic.' As is often the fate of titles that fall into this category, The Four Jameses has had an unusual history. First issued as a hardcover in 1927, its publisher, Graphic, was felled by the Depression. After a period in limbo, unbound sheets were bought and issued in paper wraps. 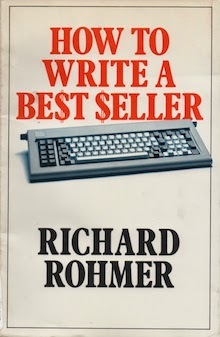 In 1953, Ryerson published a revised edition, which was followed, a little over two decades later, by this Macmillan paperback. With one publisher done in by hard times, and the others victims of manifest destiny, you'd almost think that The Four Jameses was cursed. Still, I keep it on my shelves. Deacon's book centres on James Gay, James McIntyre, James D. Gillis and James MacRae, four poets of the late 19th and early 20th centuries. They are, as Fetherling points out, united by Christian name, nationality and sheer lack of talent. 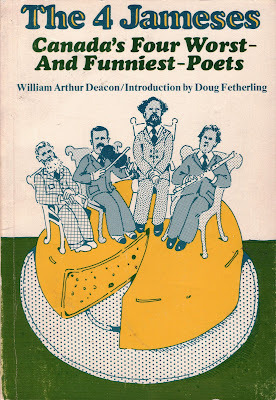 That said, I'm quick to express my doubts that they are 'Canada's Four Worst - And Funniest - Poets', as claimed on the cover. True, their work can raise a smile or two, but I've read much worse. Render her in her distress, which made the tragic struggle brief. Though so often disappointed by events beyond their power. They were finally reunited at their own appointed hour. We may hope that they were married at the altar steps above. MacRae didn't let another 46 years pass before publishing his next book. A septuagenarian, how could he? His Poems and Essays was published in 1930. Here I admit that my preference for MacRae is influenced by my move to this pretty little town last year. I, too, have found the library to be an 'unfailing source of enjoyment' - though, I regret to report, it contains not a single volume of MacRae's verse. Nor does it have a copy of The Four Jameses. Object: We all live on a yellow hunk of cheese... I can't imagine how many people were turned away by the cover. Fairly typical of Macmillan's paperbacks, at 35 it's holding up quite well. Access: The Four Jameses is readily available in our larger public libraries, most often in the Macmillan edition. The Graphic Publishers first is by far the most attractive, and includes illustrations and photos not found in the others. Nice copies of the cloth and paper editions can be found for under C$30. The Ryerson edition, the least desirable, can be had for C$20. 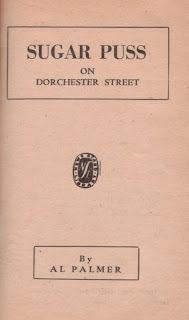 Macmillan's 1974 edition benefits from Fetherling's informative Introduction. Curiously, it's the least common of the three - only two copies are currently listed online: one going for US$11, the other at US$59.85 (on offer from an optimistic bookseller in Little Elm, Texas).